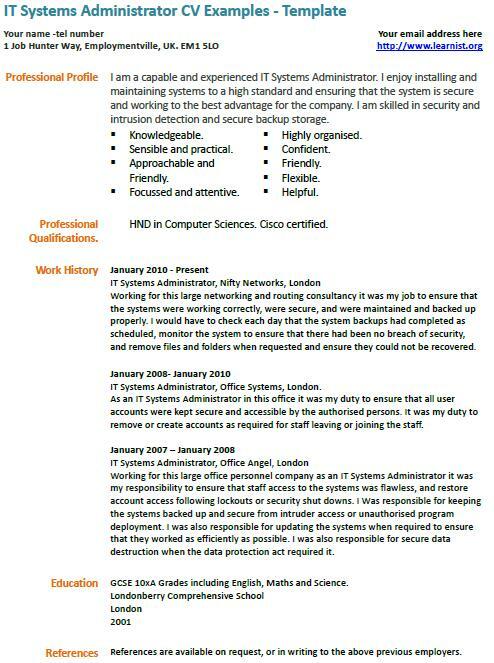 IT Systems Administrator CV Examples – Template. Amend this cv example as suitable and write your own CV in minutes. I am a capable and experienced IT Systems Administrator. I enjoy installing and maintaining systems to a high standard and ensuring that the system is secure and working to the best advantage for the company. I am skilled in security and intrusion detection and secure backup storage. Working for this large networking and routing consultancy it was my job to ensure that the systems were working correctly, were secure, and were maintained and backed up properly. I would have to check each day that the system backups had completed as scheduled, monitor the system to ensure that there had been no breach of security, and remove files and folders when requested and ensure they could not be recovered. IT Systems Administrator, Office Systems, London. As an IT Systems Administrator in this office it was my duty to ensure that all user accounts were kept secure and accessible by the authorised persons. It was my duty to remove or create accounts as required for staff leaving or joining the staff. Working for this large office personnel company as an IT Systems Administrator it was my responsibility to ensure that staff access to the systems was flawless, and restore account access following lockouts or security shut downs. I Was responsible for keeping the systems backed up and secure from intruder access or unauthorised program deployment. I was also responsible for updating the systems when required to ensure that they worked as efficiently as possible. I was also responsible for secure data destruction when the data protection act required it.